The kitchen is one of the focal of points of every home. Whether you’re hosting a party for friends, entertaining relatives, or simply feeding your family a wholesome, home-cooked meal, it’s commonplace for the kitchen to be a hub of activity. So, it's important that you give the room as much design attention as you would any other room in the house. In particular, it’s important for you choose the right kitchen doors. Tasteful kitchen doors can add the finishing touch to the room, gracefully tying your design elements together. Read on to find tips about the different styles that work well as kitchen doors. Originally used in rustic, farmhouse settings, Dutch doors have two independently swinging halves. These components once allowed farmers to leave the top half of the door open while keeping the bottom half closed. This ensured that children stayed inside, farm animals stayed outside, and a healthy breeze cleansed the home’s interior. Dutch doors are still used today, and they work especially well as kitchen doors, especially for homeowners who seek a distinctively rustic tone. 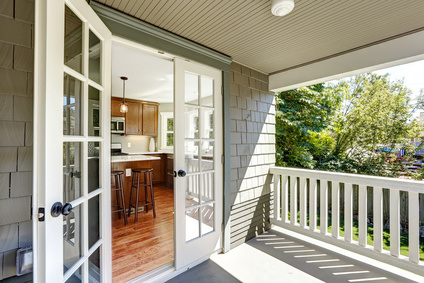 Dutch kitchen doors, especially those leading outside, still allow you to keep unwanted intruders from messing around your kitchen while maintaining a steady influx of fresh air. This fresh air is particularly important, as it prevents mold from growing and compromising the cleanliness of your kitchen. Barn doors are the rising stars of the door world, as today more and more homeowners are choosing to include this style in their home. Essentially, barn doors are exactly what they sound like: a rustic door styled after the wooden doors used for the entryways of barns. Barn doors for your home are most often installed on sliding tracks, so that they open and close by sliding back and forth. While barn doors make for great kitchen entryway doors, they are also good choices for your cupboards and pantries. Since barn doors slide back and forth, they don’t take up as much space as conventional doors that swing out to open. Like sliding barn doors, pocket doors also open by sliding back and forth. The major difference is that pocket doors open by sliding into a wall, whereas barn doors open by sliding back and forth across a wall. While barn doors fit well in rustic settings, pocket doors fit better as kitchen doors in more contemporary or modern homes. Pocket doors are also an excellent choice for pantries or other cupboards. With their classic glass panels, French doors make for great kitchen doors, and are one of the most popular and the most commonly-used kitchen doors. French doors are especially good choices in kitchens (or dining rooms) that look onto beautiful backyards, gardens, or patios. French kitchen doors can make the kitchen more inviting, as they will provide the space with plenty of natural light and pleasant views of your landscaping. They can also easily open onto a patio, deck, or porch off of your kitchen. French, dutch, barn, and pocket doors are just a few of the kitchen doors that can tie the design elements of your kitchen together. For extra help choosing kitchen doors, use our helpful database to contact professional contractors in your region today.